The Philadelphia Federation of Teachers, the American Federation of Teachers and several government officials gathered outside Key on Friday demanding actions to remediate local public schools. 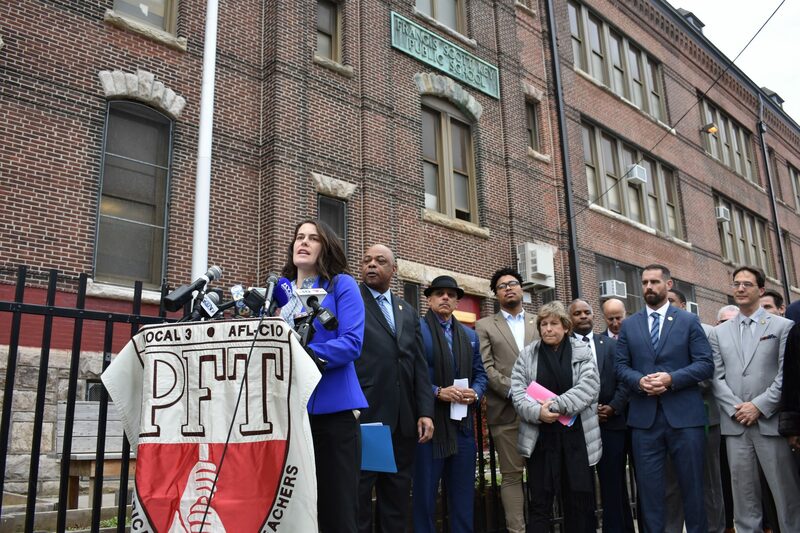 Elected officials and union leaders convened outside Francis Scott Key School on Friday to propose the new Fund Our Facilities coalition, which plans to cultivate an immediate $170 million investment toward the repairs of Philadelphia public schools. In light of more than 200 aging schools afflicted with a scope of health hazards, the team of more than a dozen city and state representatives and union officials are demanding the funds from all levels of government to be allocated as soon as possible. These funds are separate from the billions of dollars needed to simply bring all of the city’s public buildings up to code. According to the coalition, $170 million would adequately remediate various infrastructure and toxic-related concerns in schools, including more cleaning and maintenance staff; rodent and pest control; asthma control; accelerated and expanded lead-paint stabilization; window replacements; bathroom, electrical and lighting upgrades; and repairs to water leaks. While the team is still configuring the source of the colossal investment, Jordan says, as of now, funds will stem from all three levels of government. Some of these funds, for example, could be sustained from Gov. Tom Wolf’s Restore Pennsylvania initiative, which, if passed by the state legislature in the upcoming weeks, will generate $4.5 billion through the monetization of a “commonsense severance tax” with funds designated for various infrastructure projects,including the remediation of public schools. Seeking “creative ways” to support this $170 million funding, state Sen. Vincent Hughes suggested amalgamated efforts, such as last year’s more than $15 million in combined state grants and city school district funding, which continues to address toxic issues in up to 40 public schools around the city. Hughes stresses, though, that this expenditure is merely a drop in the bucket. Members of the growing citywide coalition include state Rep. Jason Dawkins, Philadelphia House delegation chairman; Councilman Mark Squilla; state Sen. Larry Farnese; and state Rep. Elizabeth Fiedler. Serving as the oldest school in the city, Key Elementary, located in the Lower Moyamensing neighborhood, represents dire concerns students and teachers encounter in antiquated and menacing public schools around the city. The coalition emphasizes that spaces such as this South Philadelphia institution are entitled to the same capital as the rest of the commonwealth. Councilwoman Cherelle Parker shed light on the fact that the average Philadelphia public school is 66 years old, while the national average is 42. She also says more than 75 percent of them were built before 1969. The coalition feels these aging conditions are unacceptable, considering the higher investments put into suburban Pennsylvanian public schools in the suburbs, such as Lower Merion Township. Although funding sources are still being negotiated, the coalition says the purpose of the news conference was to make its vision seen and voice heard. Moving forward, the team hopes to recruit more representatives of the city, state and federal government. The emerging Fund Our Facilities coalition strives for their concerns to be heard all the way from the corner of 8th and Wolf streets.